Lebanese President Emile Lahoud is calling for a cease-fire but says the country will defend itself if invaded. Can Israel's offensive destroy Hezbollah? (CNN) -- President Emile Lahoud has urged the Lebanese to remain united in the face of an Israeli offensive against Hezbollah and logistical targets in Lebanon that was in its tenth day Saturday. In an interview with CNN's Nic Robertson, Lahoud again called for a cessation of the violence and said that if a cease-fire can't be brokered, the Lebanese army is prepared to defend the country -- and Lebanese solidarity ultimately will save the nation. ROBERTSON: Mr. Lahoud, it's now 10 days into this war. Is your country any closer to a cease-fire? LAHOUD: It is getting much worse, and day after day more targets are getting hit. As you know the airport has been hit, all bridges, big bridges, small bridges, and now the roads. Only yesterday, only 200 meters from here, at 11 at night, they hit the road. Just like this, they are creating fear and, really, it is cycling to the point of no return. That is why that as soon as possible we are asking that there be a cease-fire. ROBERTSON: Is there enough diplomacy under way, international diplomacy, to bring that cease-fire? LAHOUD: Yes, we've had lots of visitors coming from abroad. But unfortunately they are talking, going, and coming and talking all the time but with no result. And this makes us think, is there anything behind that? Do they want to give more time to Israel to hit more? LAHOUD: Well, I think they are giving more time to Israel to hit, thinking that maybe Hezbollah will give up. Hezbollah will not give up. And because of that there will be more casualties, more destruction. LAHOUD: Well, if you knew the interior politics of Lebanon, you will understand that in 2000 Hezbollah was the main liberator of our land. And at the time, the Lebanese army was and still is with what is happening on the frontier. Because, you see, what was happening was Israel with airplanes ... but having the resistance, they think twice. And because of that there is no animosity between the army and the resistance. ... The resistance are Lebanese. LAHOUD: Believe me, what we get from our side is nothing compared to if there is an internal conflict in Lebanon. So out thanks comes when we are united, and we are really united, and the national army is doing its work according to the government, and the resistance is respected in the whole Arab world from the population point of view. And very highly respected in Lebanon as well. LAHOUD: Of course, the army is going to defend its land, and inside Lebanon they can do a lot. They cannot be strong enough to be against Israel on the frontier, because they have much more stronger materiel and weaponry. Inside [Lebanon] they know the land and, of course, they will fight the invading folks of Israel if it tries to come inside. ROBERTSON: You will give them an order to go fight along the border? LAHOUD: It's not Lahoud who gives them the order, it's the government. And I'm sure the government will give the order not to allow Israelis to invade Lebanon, for sure. ROBERTSON: How close is this country to moving its army into the fight now? LAHOUD: Well, I can't tell you now. What we're thinking is to have a cease-fire. That's what we're thinking because things that have been happening have not been happening before. I'll give you an example: Only yesterday, 23 tons of ammunition explosives came on one building, one mosque that is being built. That is more than is a tactical nuclear bomb. That means that they are using like a tactical nuclear [bomb]. But because [it is] conventional weaponry, no one is saying anything. But the result is really havoc, and we can not accept it. So before thinking about anything else and telling the army what to do and all that, the international community must really, as soon as possible, stop this killing, stop this fire. And then after that we can talk about what to do. ROBERTSON: What are the terms of a deal that have to be worked out, and who is going to tell Hezbollah to stop fighting? LAHOUD: If there is a cease-fire then they will start talking about everything. ... And they were discussing it, and they postponed the meeting for the end of this month to talk about the same subject. So why not let the Lebanese between themselves solve this thing? ROBERTSON: Can the Lebanese government accept a buffer zone, an international buffer zone, with the strength of U.N. force between Lebanon and Israel? LAHOUD: All of these subjects can be talked about after the cease-fire, because if you talk about it now it's up to the decision of the Lebanese to decide that and the government. Now, if we start talking about this, this is between the Lebanese, and probably that is what Israel is trying to do because by hitting all the time it makes maybe some Lebanese have conflict with other Lebanese. And it has been trying six years to do that. ... And now that the Lebanese are united they are trying to find a way to divide them. We're going to stay united, and that's what makes the strength of Lebanon. And we want ourselves to solve our problems, not to force these problems on us. Because when you force these problems, believe me, when we are united nobody can do it. And the proof is that when in 2000 nobody believed we could liberate our land but we could do it because the Lebanese were united and the national army was with the united Lebanon and with the resistance. LAHOUD: Yes, but we're not going to let them. Because the Lebanese have learned the lesson. Because when they fight between themselves it's much worse than having someone come from outside. Because we've seen what happened in '75 because we paid a very high price. Now, being united, whatever Israel can do we stay strong, because this makes the morale of the Lebanese stronger when they are united and no one can beat them. ROBERTSON: Having so many displaced people moving around the country, half a million according to the U.N., raising tensions. We saw a situation yesterday where displaced people told us they were being turned away from collection centers along sectarian, religious and ethnic lines. LAHOUD: Believe me, this is not true because they are welcome in all our homes. And all Lebanese are saying whoever wants to come is very welcome, and they have made centers all over Lebanon to welcome them. ... So let's live together and, like the late Pope John Paul said, let Lebanon, who has 17 different religious sects, is a message to the world that we can live together. So, if we can live together under stress like now, and after this finishes we can become even stronger. And it will be a strong message to the world that religious sectarians and people in the world can live together in peace and harmony. ROBERTSON: Are there any behind-the-scenes diplomatic talks under way that are going to de-escalate the situation right now? LAHOUD: Well, we hope so. Talks are being made and many are trying to find ways how to solve things but they are slow. ROBERTSON: Is there anything concrete on the table? Any concrete plans? LAHOUD: Until now, no. We have just heard secretary-general of the U.N. He proposed the plan and said we'll talk about it. But children are being killed, massacred. And we don't see these pictures of these children in the international media because of political reasons. If you see them, well you can't wait to talk about it and wait for these children and women with nowhere to go and live under bombs and shells. They just live outside. They don't have a shelter. We can't wait for the talks to go on. Meanwhile the aircrafts are bombing whatever they want in Lebanon. It never happened. ... I don't see anything in history that has happened like what is happening now. Airplanes are hitting civilians all over the country and [there is no] retaliation on these airplanes because they are civilians. Now, they want to solve this, they must stop the fire and sit around the table and talk about this. ROBERTSON: But if there is nothing on the table right now, the implication is that this is going to spiral out of control, get worse, and spread throughout the region. LAHOUD: Exactly, and that's why we're saying we don't want to reach the point of no return. ROBERTSON: Are you at the point of no return yet? LAHOUD: We are close, but not yet. We can do a lot if we can stop the fighting now. LAHOUD: I hope ... that we solve this problem before it escalates and then we can't stop it. Believe me, violence brings violence, and it will be a cycle that no one will be able to get out of and everybody will lose. If Israel thinks it's going to win, it's very mistaken. You cannot solve things and have peace in the region with violence. It might be now they have all this weaponry. But what about the children and the people who have brothers and sisters now dying? Well, they're pushing them to, really, well, they don't have anything to lose. For them, their life is nothing, so whatever will do to them. In the future they will seek revenge. So the only way [is] to stop the firing right now for the good of everybody. ROBERTSON: There's no timeframe yet for Secretary Rice to visit the region, how much does that concern you? LAHOUD: Well, I can tell you it was said two days ago that she was coming and she didn't come. ... But it's not coming and going that counts, it's the solution that counts. We hope they have a solution for the cease-fire. 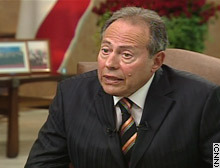 LAHOUD: All I can say is now two soldiers have been taken and in response they are doing massive destruction in Lebanon. Is that right? I don't think so because it is very disproportionate. Two soldiers have been taken, and in the past soldiers have been taken and they exchange. So now, why they are doing that? Because they have a previous plan and they are executing that plan in that way thinking they will do what they did in '82. But things have changed since '82. LAHOUD: It's a catastrophe. If I told you there's nothing to eat, nothing to put fuel in their cars, electricity is nearly always stopped. You can't go on the road because you don't know when an aircraft hits you. ... And we know very well, by the satellite you can see the number of the part. So how can they make that mistake? They're using these ways to make people afraid and leave the country and then bring down the morale of the people. And then at the end they come and occupy and do what they did at the end of '82, or change everything in Lebanon and have it the way they want it like they did in '82. We're not going to let them. ROBERTSON: How bad is the destruction? How long will it take the country to rebuild? How much will it cost the country? LAHOUD: Only today I [was] told that everything is going up quickly. Now it's $3 billion, only two days ago it was $2 billion. ... Well, some bridges take five years to build, so it will take the same. But even then we don't want to reach the point of no return. Because once you reach the point of return, it becomes desperate, and he's ready to die for his country and this becomes a big problem for everybody.